Laparoscopic (LAP) surgery has experienced significant growth since the early 1990s and is now considered the standard of care for many procedures like cholecystectomy. Increased expertise, training and technological advancements have allowed the development of more complex LAP procedures including removal of solid organs. 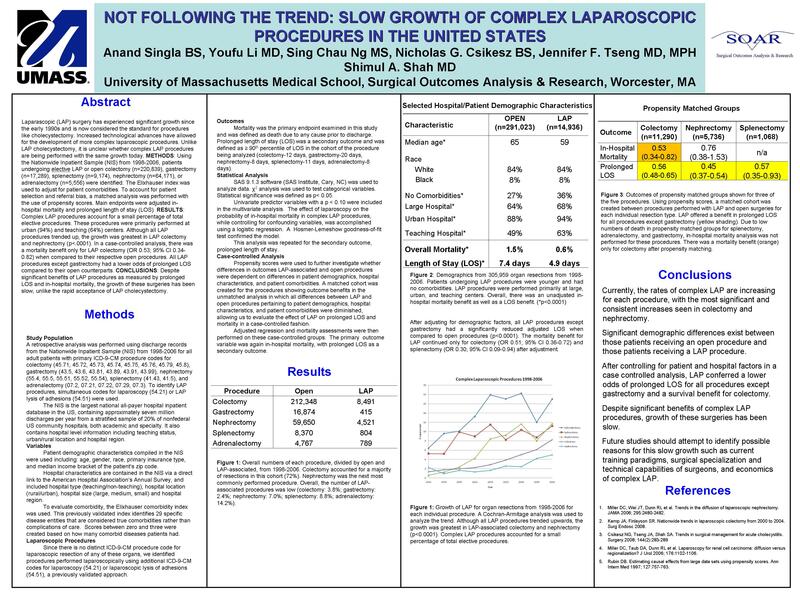 Unlike LAP cholecystectomy, it is unclear whether complex LAP procedures are being performed with the same growth today. Methods:Using the Nationwide Inpatient Sample (NIS) from 1998-2006, patients undergoing elective LAP or open colectomy (n=209,769), gastrectomy (n=17,289), splenectomy (n=9,174), nephrectomy (n=64,171) or adrenalectomy (n=5,556) were identified. The Elixhauser index was used to adjust for patient comorbidities. Main endpoints were adjusted in-hospital mortality, adjusted length of stay (LOS) and total hospital charges.